Everything Is Art: Painting of the Day: "III P R I N T E M P S"
Every medium has a different appeal. For ink, it's this magical quality whereby every flick of your wrist counts. Where every stroke cannot be altered. Perhaps in my head, I associate ink to old story book illustrations, maybe that's why I like the medium so much. 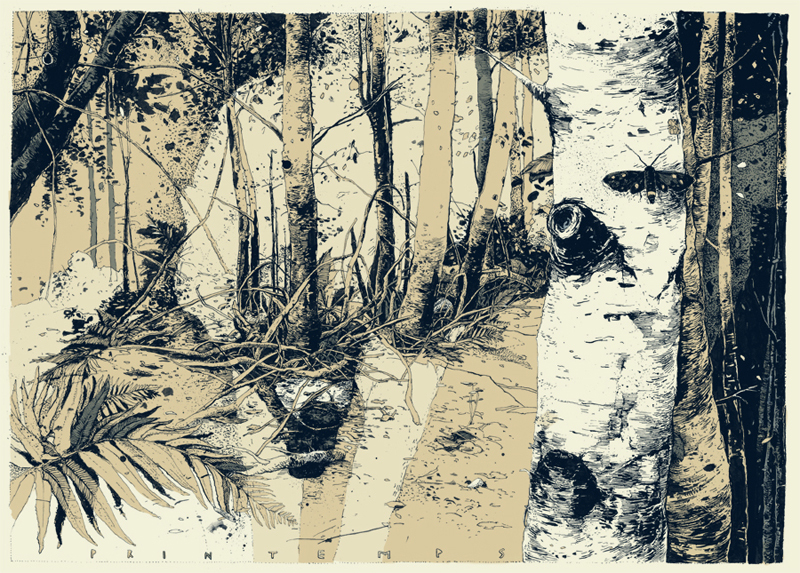 Simon Prades' illustration has that sort of story book illustration feel to it. A certain nostalgic quality that draws me into it. One might think of the story of "Little Red Riding Hood and the Big Bad Wolf". I'm more inclined to associate it with the story of the "Two Wolves". Whichever way you decide to look at it, you cannot deny that it is splendidly rendered. To view more of his works, click this.